When children walk into my studio on any given day and ask “are the baby ducks still here?” I smile knowing that we have created a one of a kind memory for this child. Baby Duck Sessions don’t just create adorable portraits for parents, they create memorable experiences for the kids. This will be our 10th year photographing with the baby ducks and I simply can not wait to get on the ground and laugh with the children as they quack along with our little yellow friends. When I think of children’s literature one of the first series that comes to mind are the Classic Pooh books. I grew up on these books and I know many of our children are as well. Winnie the Pooh is a fun loving tale of friendship, imagination and of course honey! Your children will play with the baby ducks in front of Pooh’s honey tree. The ducks will be held in honey pots and waddle around trying to find every last drop of the yummy goodness! Every child will get to take home their own miniature honey pot as well as some local honey! Update as of 2/15 – Saturday March 2nd is sold out. There are still appointments available on March 3rd. Another childhood favorite, which is now an Amazon Prime TV series, “If you give a mouse a cookie”, has become one of my son’s favorite books. While trying to come up with our Simple Duck Set I thought this would be a fun take on that book! The background will be simple and your children will sit on the floor with stacks of books as the ducks stand on them trying to read a good story! More fun than you can shake a duck tail at! 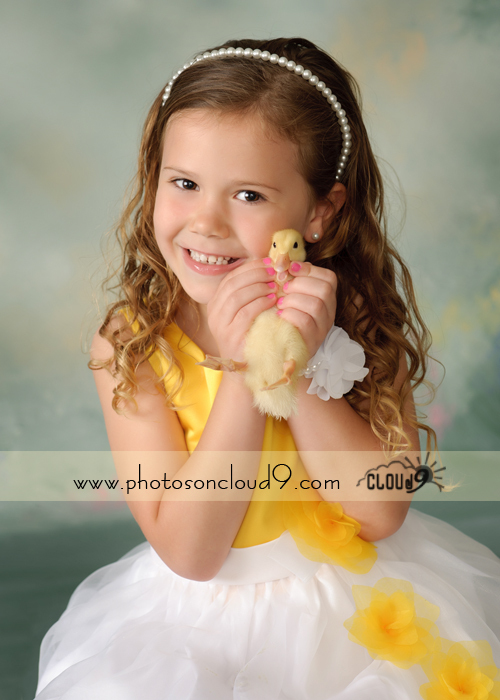 Our Baby Duck Portraits sell out every year … if you are interested, don’t delay and call the studio at 813-994-4552 today! We have had fun photographing with the Baby Ducks since 2009! Here is a gallery of just a few favorites from the past few years …. We are often asked how we take care of the ducks at the studio. Let me just say that our ducks live in luxury for the week they spend with us! Our kitchen is turned in to a Duck Day Spa where they are kept warm with a heat lamp, given yummy duck feed food and water in a safe environment for babies without a mommy duck. When we photograph with the ducks I have my assistant within inches of the set to work with the ducks and the children. We take every precaution possible to ensure that no child or duck is harmed while being photographed. In fact over the past 10 years it has been amazing to watch how much the children learn to love and be gentle with the baby ducks. One little girl has even told me that her sessions with the ducks over the past few years has inspired her to grow up to be a veterinarian! How cute!